The last time I was in Austin I was browsing the cooking section of the bookstore (yes, there are still bookstores out there and yes, I go to them) and my eyes were caught by a book called Make the Bread, Buy the Butter, by Jennifer Reese. I picked it up and thumbed through it. Now that I am making so many things myself, I was curious to see what she had to say about it, especially the idea that there are some things one should not try to make from scratch. I already had my own, informal and relatively unformed, list of those things that are best bought, but that list is constantly changing as I learn how to make more and more of my own food. Five years ago I would never have thought I would be making my own mayonnaise; two years ago the idea of making my own mustard, ketchup, and Worcestershire sauce would have been unthinkable. And I have been making my own bread, granola and crackers (yes, crackers) for years now. I thought it would be interesting to compare my experiential list to hers. And mostly, I agreed with what she said. There are certainly some things better left to the experts. Until I get a bigger kitchen, canning is not in my future, nor do I see myself making a home for cows, goats and chickens anytime soon. And while I do plan to experiment with cheese and yogurt, I doubt I will go past the basic simple paneer and ricotta, possibly mozzarella. But nothing that needs to be aged or kept in a dank, dark cave. Jennifer Reese started her project when she lost her job and was mainly looking for economical ways to feed herself and her family. While I care about my money and how I am spending it, my primary motivating force is keeping the foods that I eat as chemical and preservative free as possible. On the way, I have discovered that I actually prefer the taste of homemade to store-bought, and I can often (though not always, I admit) taste and feel the difference between the two. That was not always the case. When I first started making my own condiments, for example, they tasted nothing like the mayonnaise, ketchup, and ballpark mustard that long were my standards. And salad dressings never tasted right. But after a period of not having the commercial brands around, my attempts tasted better and better, and now I do prefer the taste of what I make myself. Like everything else, it is a process. Nothing comes out the same every time, but it is all good, and when it is really good, it can be transcendent. As with life, if you aren't willing to experience any of the lows, you won't be able to enjoy the highs. I was pleased to discover that peanut butter fell into the "make it yourself" category in the book, as I have been making my own peanut butter for the past six months, and I was interested to see her recipe. I don't remember all of the details of it, but I do remember that there were several ingredients, including oil. 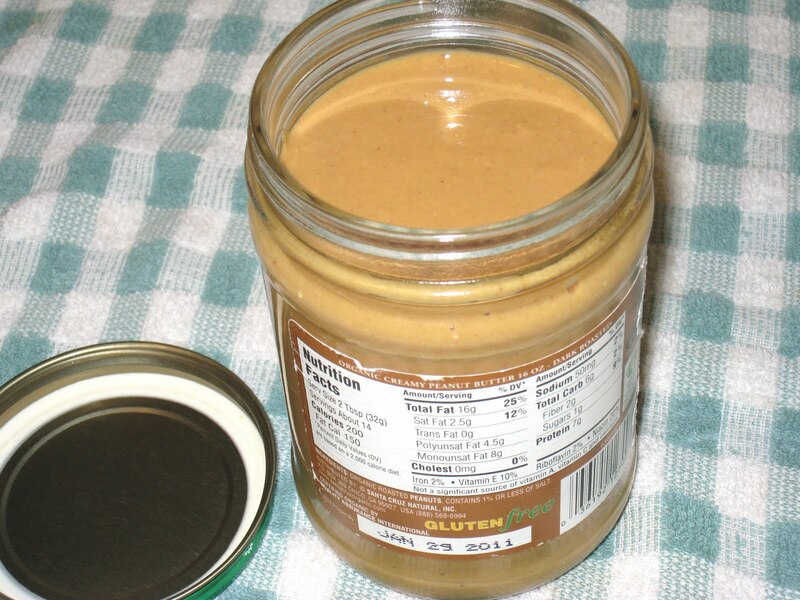 The first time I made my own peanut butter I added oil, but I soon realized that it was completely unnecessary. All you need to make peanut butter is peanuts. Maybe salt, if you want it to be a little salty. But you should never need to add oil to peanut butter. It can look like you do, because when you first start grinding it up it makes a thick paste of the ground peanuts that doesn't look like it will ever break up. 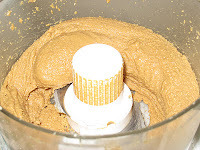 But if you are patient and let the food processor continue to do its work, the paste does break up and you end up with the smoothest, creamiest peanut butter, one that looks and tastes exactly like the natural brands that are on the grocery store shelf. A lot of my friends (and family) don't buy natural peanut butter because it is so hard and messy to stir together the nuts and oil that have separated after sitting on the shelf for so long. One trick I learned from my brother to solve that problem is to store your jar upside down on the shelf, so that all of the oil is on the bottom when you turn it over and open it. But if you make your own, that will never be a problem because there is no separation when it is fresh, and if you put it right into the refrigerator, it stays together. And because everything is already well integrated, you don't get that impenetrable mass of peanut paste that you sometimes get when you didn't combine it evenly. It took me a few tries to get it to the right consistency, so I thought it might be helpful to offer a step-by-step tutorial of the process, with photos to show how it should look throughout the process. 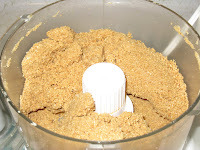 All you need is a pan, the peanuts, and a food processor. Do note that this will not work in a blender. I have it on good authority that it will burn out the motor. 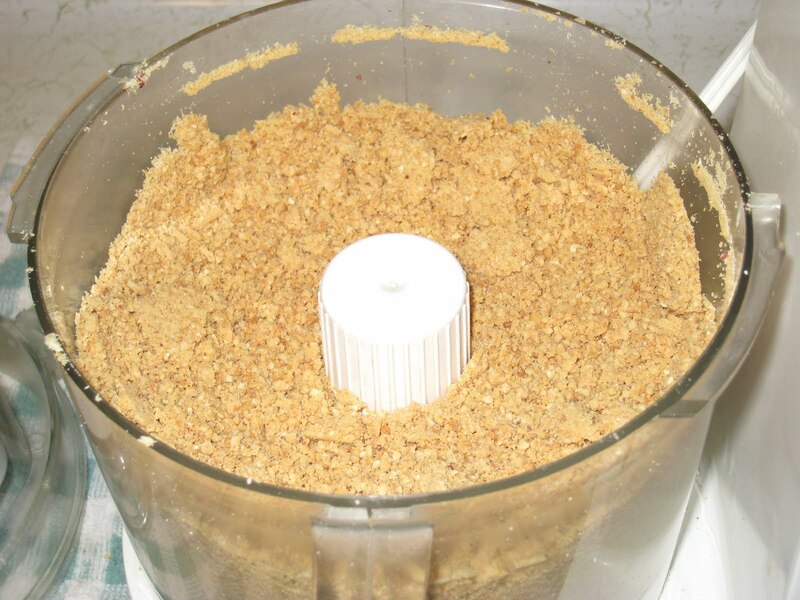 This might sound like a lot of work, but it doesn't take long at all, and the food processor does all of the work. 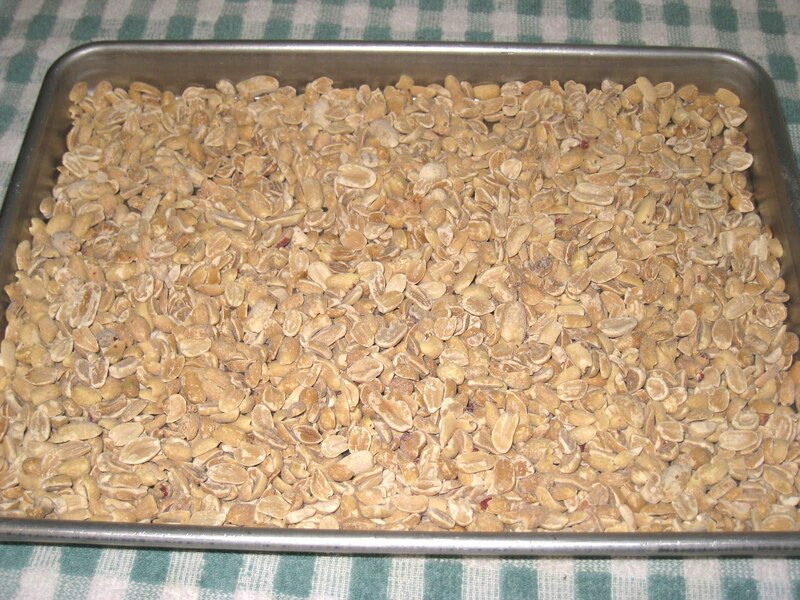 The whole process takes less than an hour (slightly more if you roast the peanuts, but you can do that as early as a few days ahead). The first thing you need to do is to get your peanuts. I buy roasted valencia organic peanuts in bulk at Whole Foods, but you can really use any roasted (not dry-roasted, though)peanuts. I like a dark roast, though, so I put them in a pan and roast them at 350 deg. F. for about 12 minutes, and then let them cool. Sometimes there is still some of the red peel on the nuts. I will go through them and remove as much as I can, but I do not get overstressed about it. A little won't hurt. 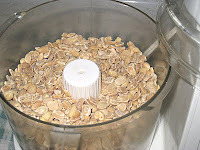 After the nuts have cooled, place them in the food processor bowl. I usually use a pound of nuts. That fits nicely into the food processor, and the finished product goes right into a leftover peanut butter jar from when I used to buy it. 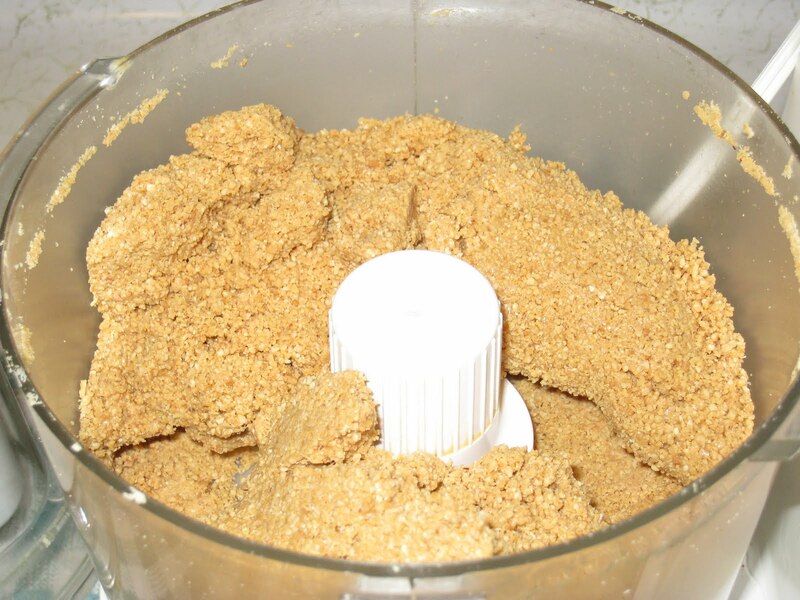 If you have more than one setting on your food processor, put it to the highest setting and turn it on. Let it go for a few minutes, until your peanuts have been ground into teeny little pieces that look like this. 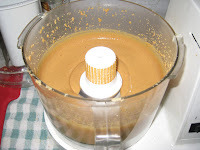 While you can just let the processor go until you have peanut butter, it is a good idea to stop every once in a while and see how it looks, especially at the beginning, when you are still not sure how it supposed to look at each stage of the process. 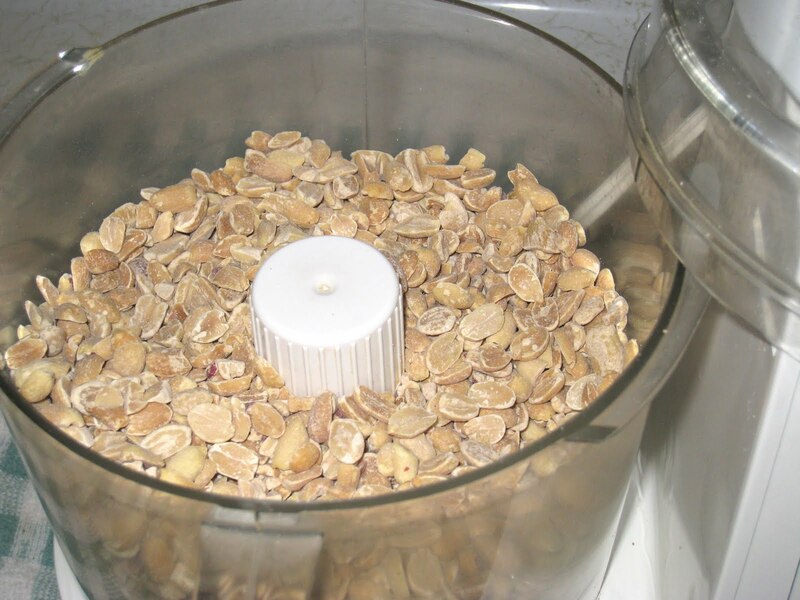 At some point the peanuts will start to clump together as they are whizzing around the food processor bowl. Eventually, it will solidify into a solid mass on one side of the bowl that looks it will never budge and just might possibly burn out your motor. This is the point where most people believe it needs some oil to get it going. They would be mistaken. You can let it keep going and it will eventually work through the mass or, if you don't believe it will ever make it through, you can turn it off and let it pulse every few seconds. The stopping and starting of the motor will slowly move the lump around the bowl until it is evenly spaced around the bowl and moving smoothly again. Eventually, it will look like this. You can still see the pieces of peanut, but you can also see that the oil has separated out and it is starting to get smooth. Let it run for another 2 or 3 minutes, but be careful. I have heard that it is possible to overwork it and end up with a liquid that cannot be saved, but I have not had that happen yet and I have let it run for up to 3 minutes. And just when you think it will never happen, the last little pieces of peanut disappear and you are left with a bowl full of beautiful, smooth, creamy peanut butter, just like this. 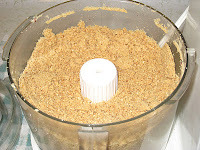 If you prefer crunchy, set aside half a cup or so (to your taste) of the peanuts and grind them to the desired size. 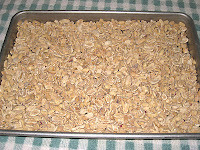 Follow this process withe rest of the peanuts and then stir in the ground peanuts.